Hangouts: A Politician's Alternative to Walk Cards? 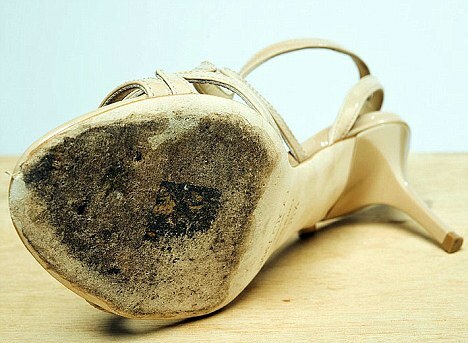 When my sister, a 4th grade school teacher in Missouri, decided to run for State Representative, she literally wore a hole in her shoes going door to door meeting with voters face to face. She walked dozens of miles across 6 counties and many of the homes she visited, no one answered the door so she left what politicians call a "walk card".... a business card or brochure that tells that household about the candidate. Now, there's a new kind of door knocking that spares your Sperry's thanks to a feature called Google Plus Hangouts On Air. Yale University has provided at least one case study that in person door knocking is effective. Meeting people face to face is what Robert Brawley credits for his recent North Carolina Primary win, an upset. 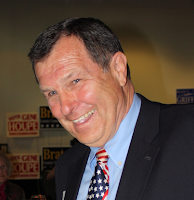 “I think people voted for me because I went door-to-door, shaking hands, talking to people, right from the beginning,” said Robert Brawley in an interview to Dave Gowing with the Mooresville Tribune. “I think they appreciated the direct, personal contact,” said Brawley. Similar to in person door knocking, a hangout enables virtual door knocking but will it be just as effective? "There are some aspects of this which will make or break success," said Joseph Puglisi, a NYC blogger who writes about G+ Hangouts. "A candidate holding a hangout may not attract a lot of people unless they know about it. Building a following or promoting the event through email or other means will be critical to the success. " A hangout is a face to face group video conference for up to 10 people that is streamed live on You Tube. One host and 9 different guests can join. When the host talks, they are automatically displayed in the largest box of the Hangout. The technology is not the only feature that makes it powerful. A Hangout is in the middle of the social network of Google Plus, which is a crowd sourcing tool, a phone book_ of sorts for politicians. Within G+, politicians have the ability to find people in their district, invite them to a hangout, connect with them face to face and leave a virtual "walk card". 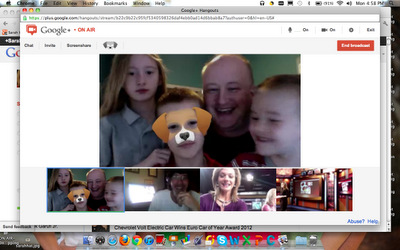 Hangout hopping is a popular past time on Google Plus. The open Hangouts are displayed like houses in a neighborhood. These are individuals who have turned the lights on their virtual front porches. You can choose to watch or join them. All that's required to Hangout is a web cam, an Internet connection and the guts to talk to strangers. In the future, not only could candidates hit a number of virtual doors in an evening without leaving their office... but with HOA, that conversation is then amplified live on You Tube and automatically saved on You Tube for sharing on your social sites later. Instead of in person "listening posts", a candidate could hold virtual office hours and allow their constituency to share via web cam the issues important to them. Create a Google Plus account by going to www.plus.google.com. Upload a profile photo and fill out your bio. Go to www.findpeopleonplus.com to find G+ users in your area. Circle them and provide them with a compelling reason why they should circle you by sharing interesting content in your stream. Google Plus is not Facebook. It's not necessarily for your friends. It's all about talking to strangers. Join some public (open to everyone) Hangouts to understand how the technology works. I have a public Hangout M-F daily at 3:30 pm Central. You're welcome there. In that hangout, we talk about how to mute your mic, Hangout etiquette and how to navigate the internal chat window. Once you get the hang of Hangouts, start your own Hangout. Email your constituents the date/time of your Hangout. 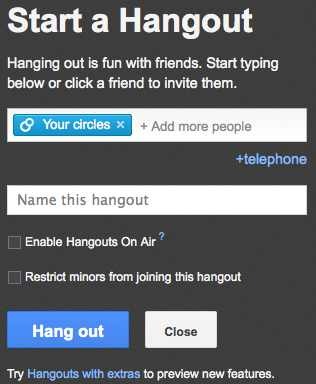 Check the "enable Hangouts On Air" box and invite your circles. Invite your guests to share, ask questions and invite others to the Hangout. Click the "start broadcast" button and that puts your Hangout On Air live on You Tube. At your You Tube Channel, (created from the email address you provided for your G+ account), you'll find the link to watch your streaming hangout. Post the link to the Hangout On Air on your other social sites like Facebook and Twitter. Let people know they can watch your HOA live or they can join in the conversation. Invite your guests to share, ask questions and invite their neighbors to watch the Hangout. Invite your opponent to the Hangout and create your own virtual debate live on You Tube. Do not share any copyrighted material or music. Do use the ice breaker apps like face overlays and games to make your guests feel comfortable. Can you imagine schooling your state representative in a game of Monster Milk Truck? After the Hangout, click "end broadcast" and the video recording of that session is automatically uploaded to You Tube where you can then share that link on your website or other social sites as a video log of your interactions with constituents. No capturing software required. It's automatic. You can also edit that video using the free tools on You Tube. Hangouts are like a magic carpet that can take you around the world or around your district in a matter of minutes. I wondered how long it would take politicians to experiment with this space. President Obama was the first to use a Hangout. The GOP and Libertarian Candidates have also had Hangouts and last week, I had our first Mid-MO Missouri politician ask how to use the Hangouts On Air feature. Virtual door knocking doesn't replace good old fashioned shoe leather politics but in the future it might be able to greatly reduce the holes in a candidate's shoes. Great article and break down, Sarah. I appreciate your work on opening the door to G+ for many of us, revolutionizing the way we communicate online. And, being a politician myself, I really look forward to using this tool in the future! Perfect... Hangouts and Politics... a perfect match! I'll read this whole article soon, I may link from my blog/video post about the topic to it (if that is OK)! FYI, mu profile pic is a Video SEO Hound at times, you know me as the Guy with the Red Arrow/Santa Hat (Ronnie Bincer)!